March 22: this will be the first spring Sunday of the year. But that’s not the only thing Rome is going to give her visitors: it’s also the day of Rome Marathon 2015! – FREE TRANSPORT: undergrounds, trams and buses will be free of cost for all Marathon and RomaFun partecipants: just keep your bib number visible when you catch any of them. – SHOWER FACILITIES: the following sport clubs will offer after-marathon free showers to all partecipants: Stadio Delle Terme Di Caracalla “Nando Martellini” Viale Guido Bacelli, 14 (near Metro B Circo Massimo) – timetable: 11.45 am – 5 pm. Impianto Sportivo Comunale Uisp “Fulvio Bernardini” Viale dell’Acqua Marcia, 51 (near Metro B Ponte Mammolo) – timetable: 12 pm – 6 pm. Due Ponti Sporting Club Via Dei Due Ponti, 48 – Timetable: 12 Pm – 6 Pm. Forum Roma Sport Center Via Cornelia, 49 – timetable: 12 pm – 6 pm. Also in this case, show your bib number at the entrance. – ART CARD: you will find the Art Marathon Card inside the bib envelop. It will give you the right to discounts on the entrance ticket to museums and archaeological sites. Only from March 19 to 24, 2015. – MARATHON VILLAGE: a wide expo dedicated to the Rome Marathon is set at Palazzo dei Congressi (EUR area, metro line B). Runners can go there and collect their bib numbers and “race pack”. Moreover, those who wish to register for the non-competitive RomaFun 5km can do it here (you are still in time: until Saturday 21). – ROME MARATHON AFTER PARTY: the after-Marathon party will take place at Nur Bar, in Via del Teatro Valle 19: on Sunday, March 22nd from 6.30 pm till late at night. It’s for Rome Marathon and RomaFun 5k partecipants & friends (don’t forget your medal or bib). Admission: € 10,00 including buffet and first drink. Free entry for children under 14. Food is served until 10:00 pm. For more information on the event and accommodations in Rome contact us at HotelRome.net! 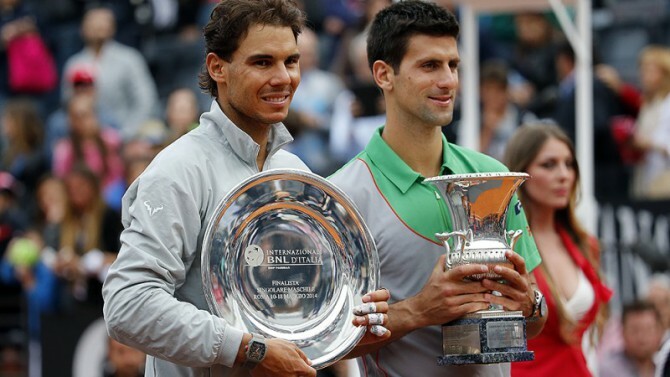 Internazionali d’Italia, one of the greatest tennis event in the world, will be taking place in Rome from May 9 to 17, 2015. Backdrop to this International event will traditonally be the Foro Italico, not far from the Stadio Olimpico. Despite three months are still left to the start, a sort of preparation is already on since some days all over Italy: we are referring to the qualification tournaments which are taking place to select those “common” tennis players who will have the chance to compete on the red grounds shoulder to shoulder with the worldwide renowned champions. The finalists for the major event in May will be chosen among any tennis players regularly subscribed to the Italian Federation of Tennis, with no restrictions related to rank position or level: anyone playing and winning these qualification tournaments will be admitted to the Internazionali d’Italia. For all the others there will be anyways a prestigious consolation prize: a seat on the bleachers of Foro Italico in May. Don’t miss Rome in spingtime and join this great event: contact HotelRome.net to buy your tickets!